Why was Janet Yellen’s speech yesterday so highly touted? My last post might be more relevant to that appearance than what is presented here. After all, each FOMC meeting begins with a presentation from the head of the Open Market Desk usually pertaining to comprehensive liquidity (or as much as the orthodox view of it allows). For all the smiles and assurances, even the FOMC is somewhat cognizant of global dealer distress. Global stocks climbed Friday after Federal Reserve Chairwoman Janet Yellen reassured investors that the U.S. economy is strong enough to support an interest-rate increase. In a speech on Thursday at the University of Massachusetts in Amherst, Ms. Yellen laid out a detailed case for raising interest rates later this year. Today’s trading is a microcosm of how upside down everything (economy included) has become of late (especially after the events of August). Where once stocks were heavily sold on even the slightest hint of a rate increase (anyone recall Yellen’s first press conference? ), they now cheer it as if complete redemption and reassurance. It must truly be bad for “markets” to cling to that as a rationale for buying out of the current and persistent price slump. Her speech is rather long and it is littered with footnotes and drawings, but the important parts really break down to two subjective claims. 1. 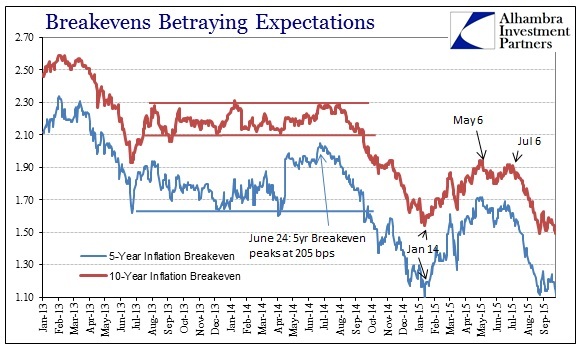 Long run inflation expectations continue to be anchored at 2%; 2. Given that baseline, deviation from it is “transitory” (a word that appeared five times in close succession when she dealt with current factors). 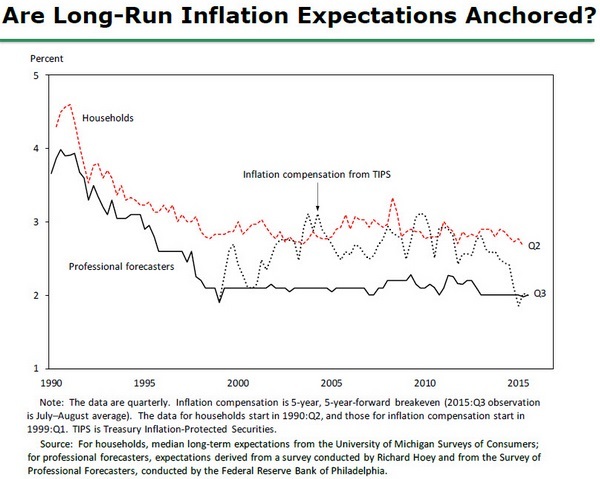 The fact that these survey measures appear to have remained anchored at about the same levels that prevailed prior to the recession suggests that, once the economy has returned to full employment (and absent any other shocks), core inflation should return to its pre-recession average level of about 2 percent. This is the mind of an academic, filled with equivocation about ceteris paribus. As the “dollar” has clearly shown in these cycles (perhaps supercycle), liquidity and economy are not separable.  The “dollar” drives down oil prices, roils asset markets and currencies all over the world and suddenly the economy is no longer so certain (in her mind; worse in forming perceptions) but none of those are related? It would be a logical stretch even under actually benign conditions, but in September 2015 with the financial world still bombarded by maintained duress and the economy looking at least shakier with every passing data point this is deliberately obtuse. First, the FOMC will strongly resist deviations from price stability in the downward direction. Falling into deflation is not a significant risk for the United States at this time, but that is true in part because the public understands that the Federal Reserve will be vigilant and proactive in addressing significant further disinflation. Against Bernanke’s August 2010 promise, the Fed has not met its inflation target in more than three years; but “transitory” and professional forecasters? Summing up Yellen’s position: we are to believe economists who do nothing more than parrot the Fed’s claimed ability to target 2% inflation even though they haven’t been near that target in more than 3 years and the actual market for fixed income and such is crashing its forecast for inflation once more? Cutting, then, through all the needless complications of academic economics, it is perfectly plain that Yellen and the Fed are desperate (maybe that is why the emergency medical issue?). Her speech, upon examination, presents nothing new that hasn’t been already contradicted by not just events this year but her very own (in)action! If she truly believes in “professional forecasters” and the 2% anchor then rates would have followed the dots set out in March 2014. There was one bit of unintentional high comedy, though germane to my interpretation of palpable orthodox anxiety, amidst all the dressed leftovers. In referring to the suite of policy programs unleashed since her predecessor’s own promises to be able to position the Fed to forestall any crisis disastrously proved insufficient, Yellen cites a recent Fed paper that (again, I am not making this up) suggests, mathematically no less, the deviation between monetary policy promises and actual economic (and financial) underperformance is nothing more than time; a whole lot of time. Our analysis implies that the peak unemployment effect—subtracting 1¼ percentage points from the unemployment rate relative to what would have occurred in the absence of the unconventional policy actions—does not occur until early 2015, while the peak inflation effect—adding ½ percentage point to the inflation rate—is not anticipated until early 2016. 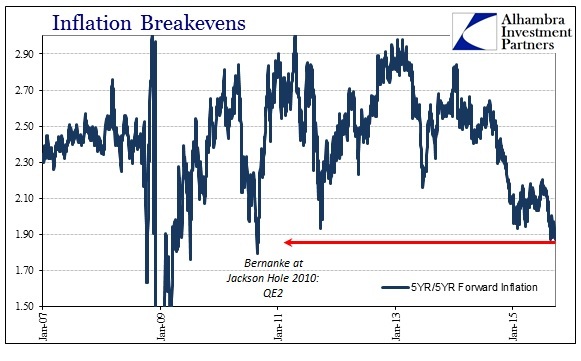 It’s wonderfully convenient, written in January 2015, that the full effect of QE’s and ZIRP wouldn’t actually show up until just a few months ahead of where we are now. That certainly settles it; the markets can ignore everything going on, the true monetary utopia was really set for early 2016 which is what Janet Yellen has been saying all along. The fact that the paper was published this January rather than January 2009 or even January 2013 is all you need to know about its regressions and 23 pages of tables and charts derived therefrom. You could have skipped the entire speech as it, and all that was presented with it, sums up exactly as I suggested above; they are backed into an “unexpected” corner and have nothing else to offer at this time but to reemphasize with charts and “studies” the same bland platitudes that have already been thoroughly disproven time and again. Markets are likewise desperate, so a lot about yesterday and today actually makes sense.